Subscribe to Airspeed using iTunes or your favorite other podcatcher. It’s all free! These are the show notes to a video episode. You can watch right here or download the video from http://media.libsyn.com/media/airspeed/AirspeedVideoFatAlbert.m4v. I was fortunate enough to get one of the last Jet-Assisted Take-Off (“JATO”) rides in the Blue Angels’ Marine-flown C-130, Fat Albert. The JATO bottles are getting more and more scarce and it’s unlikely that there will be many more rides like this. Really interesting ride, mostly because of the lack of outside references. I’m used to unusual attitudes, but it’s a little off to experience them when your only outside reference is an 18” window on the far side of the aircraft. I mounted the camera just above and behind my head. You can see my WTHR ballcap in the lower right-hand corner of the frame. Query the wisdom of clamping the camera to the airframe of a JATO-boosted C-130. The jitter and vibration is really pronounced in several places. But it stabilized whenever the aircraft got to less than about 0.5G. And those were the best sequences anyway. I’ve said it before and I’ll say it again. 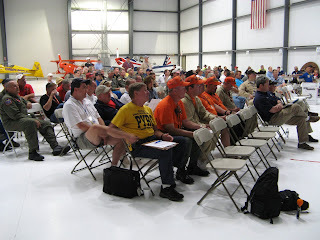 The media hospitality at the Indianapolis Airshow was spectacular. I remain indebted to Roger Bishop for the up-close opportunities as the show. These are the show notes to an audio episode. You can listen online right here by clicking: http://media.libsyn.com/media/airspeed/AirspeedRedAirplane.mp3. 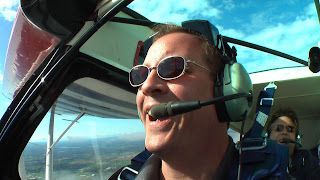 As Airspeed steams into its fourth airshow season, I’m in top gear heading out to shows and having some of the coolest experiences available below Class Alpha airspace. And I just had a day-long experience up in the Alpha on a KC-135R Stratotanker, too. More on that soon. I don’t think that anyone could say that I’ve spared much effort in chasing edges of the aviation envelope so far this year. I can’t remember who said that life is what happens while you’re making other plans. But he was right. And I had an experience with that very thing not long ago. 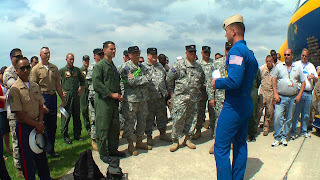 I was going to hold off on this episode until I got more of the Indianapolis Air Show content out, but I heard something on a recent episode of Uncontrolled Airspace that made me want to pull this one forward. By the way, I mention the Uncontrolled Airspace podcast way too little here on Airspeed. If you don’t yet subscribe to UCAP, you need to go and subscribe right now. Go ahead and hit pause. I’ll wait. Okay, you’re back? Good. And leave them a nice review on iTunes, too. Anyway, the UCAP guys mentioned a letter to the editor of a local newspaper by someone thanking the unknown pilot of a red airplane who had done aerobatics near the writer’s farm. This is to tell the man in the red plane that he has a fan. I’ve been watching you from the ground. Well, from my farm pastures and yard actually. More often than you know. I am in awe of your skill and the performance you give is wonderful and joyous. Who are you? Are you a man or a woman? 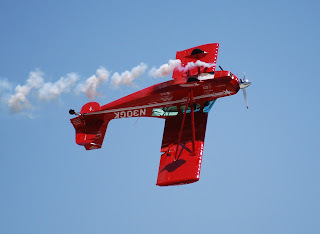 A professional stunt pilot or a pleasure flyer of that pretty red plane? Do you perform for others besides me, or is what I’m seeing just an expression of your own preferences? . . .
Not the usual complaint about noise or some perceived safety issue. A thank-you for the grace and beauty of the performance. That made me pull this episode forward. First, a little background. As I’ve attended enough airshows, I’ve gotten to see many of the performers multiple times, some more than a half dozen times. And I’ve begin to really hone in on what I love. No flies on the jet teams. I love them dearly. And no flies on anyone else. But I had an epiphany at Oshkosh last year. I was watching Greg Koontz perform in a bright red Super Decathlon. 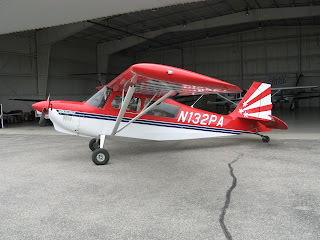 I had been flying the Citabria for a few months by then and had really begun to love American Champion aircraft. And, seeing Greg fly the Super D so well, I made a connection. That’s an airplane that you might well be able to find, and train in, at your own local airport. 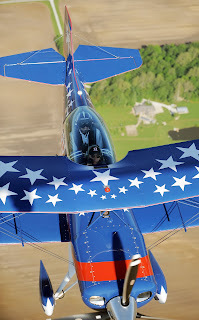 Yet here’s a guy flying that very airplane with a grace and power equal to anything else at Oshkosh. You probably heard Greg’s appearance on the show earlier this year and you could be forgiven for thinking that I’ve begun to regard Greg as a bit of a hero. One could have worse heroes, I suppose. And I got to really appreciate another part of Greg’s unique appeal at the Indianapolis Air Show earlier this month. At the opening of the show, Greg takes on the persona of Clem Cleaver from Alabama, who barges into the airshow to redeem his coupon for a flight lesson. After some back and forth with the announcer, the air boss ostensibly clears Clem and his putative instructor to get into the waiting Cub, take off, and leave the airspace. 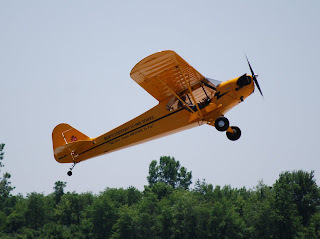 But, shortly after the engine of the Cub is hand-propped to life, the Cub begins to roll forward and Clem takes off across the grass beside the runway without the instructor. What follows is ostensibly a comedy act, but is also some of the best low-level aerobatics that I’ve ever seen. Ultimately, “grandpa” shoots the Cub’s engine with a large rifle and Greg ends the sequence by landing the Cub on a moving pickup truck. The more you see this routine (and I’ve seen it five or six times now), the better it gets. At one point, Greg, playing the terrified Clem Cleaver, pulls the Cub up to a 45-degree ascent, then pulls the throttle back all the way, pushes over the top, and yells at the top of his lungs. You can hear Greg shouting in the cockpit all the way to the announcer’s stand. Here’s the shout on Saturday at Indy. Greg ends that phase of the act by landing the Cub on a moving pickup truck. Then, a little later in the show, he gets out the red Super Decathlon and puts it though its paces, fling outside stuff, high-energy maneuvers, low-energy maneuvers, and even tumbling the airplane (not easy in a Super-D). Anyway, I know that I’ll never be an F-16, F/A-18, or even Extra 300 driver. 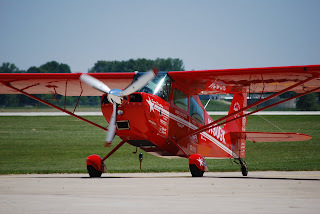 So, when I see my idealized self out there flying, I usually see myself flying a bright red Super Decathlon. Just like Greg Koontz. 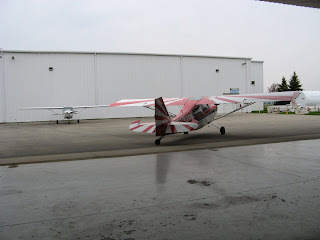 It’s a happy coincidence that Sutton Aviation at the Oakland County International Airport (KPTK), where I’m based happened to add a Super Decathlon to its line in April. And an even happier coincidence that it’s red. I had planned to fly some pretty heavy acro to prepare for the T-6A Texan II ride that I had in May at Randolph Air Force Base. I’ve never had a great stomach for acro, but I’ve found that I can work up to about 40 minutes of moderate aerobatic flight with exposure. I planned for two flights a week prior to the T-6A flight and, when the Super D became available, I scheduled it along with instructor extraordinaire and FAA Designated Examiner Barry Sutton. Barry’s an excellent instructor and you’ve heard his commentary in the cockpit here on the show. We went up for the first time on April 16 and I rag-dolled myself out in only 20 minutes. 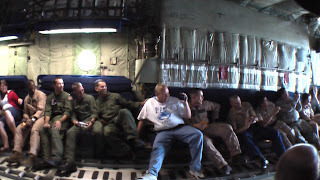 You can see video from that flight in the Airspeed video episode that posted on May 30. By May 6, I had had a few flights in the aircraft and my tolerance was getting better. I arrived at the airport to find a gray 10,000-foot overcast and hazy visibility. Solid VFR, but not the best weather for acro because you prefer a nice, sharp horizon to use as a reference when you pull through a loop or roll the airplane. So we launched and headed for the practice area north of the field. Although much of Oakland County is subdivisions and industrial parks, it gives way to wide open fields and other rural landscape just north of the airport. No federal airways nearby and plenty of vertical and horizontal elbow room so there’s no worry about being over a congested area or getting within 1,500 feet of the ground before being fully recovered. In fact, we add a 500-foot buffer over that and start maneuvers a good thousand feet above that. Barry has a pilot acquaintance, Paul, at the airport who lives out in the middle of the fields of the practice area and he has mentioned on several occasions that he’d try to contact Barry on the practice area frequency if he saw the Super D maneuvering. I’ll say at the outset that the cockpit audio here is a little distorted. I usually set the audio levels on the ground and then hand Barry the recorder to stash in back in a Velcro-enclosed pocket. Although there’s a “hold” slider on the MP3 recorder, the slider doesn’t stop changes from being made with the H-M-L sensitivity selector. I usually fly with it set on low, but Barry inadvertently switched it to “high” in the course of stuffing it into the pocket. It’s a little overdriven and distorted, but understandable. We had just finished a loop and some rolls when Paul came on the frequency. 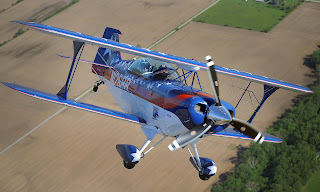 Barry, like many others, had mistaken the T-6A Texan II, a 1,100-hp modern trainer, with the AT6, a variant of the original WWII-era T-6 Texan. No matter. I just thought I’d clarify. Anyway, here’s the call-up. We did the Immelman and a couple of other maneuvers, including a hammerhead, when Barry called up Paul again. So we did the roll and then set up for an inverted pass. Paul had his binoculars out and could just about make out our tail number. We added a hammerhead at the end. Paul asked at the last pass how long the aircraft could go inverted. We follow that up a little and then Paul suggests a heading to get us toward the big empty fields near his house. Paul talked us in and then we did a series of maneuvers. We set up a show line over the fields well offset from his house and came down a bit, but still well above the minimum VFR altitude for the area and well above aerobatic minima. I’m just going to let the audio run here and let you listen in. We have our box with plenty of clearance both vertically and horizontally for the regs. Frankly, we’re a little too high for anyone on the ground to get more than a basic idea of what we’re doing. The pictures that they sent the next day were clearly taken at maximum telephoto and cropped and we’re still pretty small in the frame. But the altitude is a good thing. Barry’s giving me direction, but I’m flying the series, which makes me pretty proud of myself. I had been flying acro for quite some time, but hadn’t really done a connected series before. And now I had a chance to do it with an audience. I’m going to let this run with the omission of a couple of maneuvers where I made an attempt to record a Scheyden ad and the audio really distorted. Didja hear that? Kids shouting in the background and lady thanking me for my noble and graceful feats in the sky. Just before that thank-you, I was feeling pretty green around the gills. Not ready to park a tiger, mind you, but not in the mood to thrash myself any more. And then the voices of Paul, his wife, and the neighborhood kids. Voices that seemed excited about aviation. Voices that made the kind of sounds that I make at airshows all summer. Only the guy in the red airplane was . . . me. I was instantly not sick. Not one bit. I could have gone another 20 minutes right then and there. All because of the voices from a back yard near some sprawling fields out in the countryside. Barry and I talked about it on the way back to the airport. Yeah, it’s cool. Really cool. A magic tail number for me. That’s the Cessna 152 in which I did my first solo. It was a private pilot candidate coming in to see Barry for a checkride finish-up. Barry and I parked the Super-D, put away the parachutes, and debriefed and then I wandered back out on to the ramp. There they were. N132PA, the bright red Super Decathlon; and N94891, the little 152 that took me a long way on the journey from pedestrian to pilot. Both sitting there on the same ramp. A silent meditation of where I’ve been and where I’m going. And the echo of the tinny voice of a fellow pilot, his wife, and the neighborhood kids shouting in the background coming through my headset as I rolled and looped in a red airplane over the fields. I’ll never be Greg Koontz. Or even a lesser airshow performer. And that’s okay. I’m superhero enough for myself right now. Reading, flying, listening, talking, and, most of all, dreaming. Exploring the envelope. Becoming a better pilot and a more capable human. If I learned something that day, it’s this. Sometimes you spend too much time fantasizing about what it’s like to fly like Greg Koontz. And sometimes it seems like all journey and no destination – or at least no stops along the way. And then a flight like this comes along. For 20 minutes, you’re the guy in the red airplane. And the kids are shouting and pumping their fists in the air and pointing at . . . you. So you stand on the ramp with the 152 and the Super-D and just take it all in. And then you go home and cut the audio and write the script and try to tell a few thousand of your closest friends about what it was like. Just like now. Most of the time, you’re the scared knucklehead in the 152 or the confused guy with the hood on in the 172 or the guy with the aching right leg in the Apache or the flight-suited CAP major trying to drink from the twin 10-inch LCD fire hoses of the G1000. But, on rare occasions, magic, love, and science meet and you’re the guy in the red airplane flying upside down for the shouting kids. That letter to the editor showed me that there are red airplanes – and people who watch them – all over the country. I’ve sure as hell been the one watching. And it was nice to be the guy in the red airplane, just once. Go find a red airplane. Or whatever amounts to a red airplane for you. The life that you dream about might well be happening even as you’re focused on the mechanics and procedures of getting it to come about. Life is what happens while you’re making other plans. Don’t miss those fleeting moments when you actually are some glimmer of the hero that you daydream of being. I’ve said it before and I’ll say it again. I’m Superman and Harry Potter and Fletcher Seagull, all in good measure. I’m a pilot. And sometimes I’m even the guy in the red airplane. These are the show notes to an audio episode. You can listen online right here by clicking: http://media.libsyn.com/media/airspeed/AirspeedIndyBrief.mp3. I got to sit in on the air boss briefing at the Indy Air Show on Sunday to get a sense of what goes on behind the scenes. Here’s audio from the brief, pretty much uncut and as presented. Thanks again to the Indianapolis Air Show for the great access! This is a regular blog post. If you’re looking for show notes or links to show audio (and there’s lots of that here! ), please check the other posts. 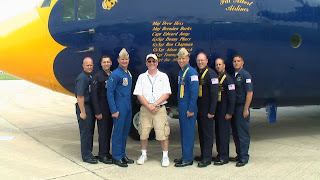 The highlight of the day was a jet-assisted takeoff (JATO) ride on the Blue Angels’ C-130, known as Fat Albert. 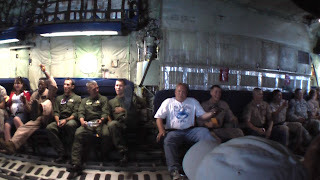 I shot video of the flight, as well as the briefing before and some of the interior of the aircraft. The in-flight video is a little blurry. I clamped the camera to the rail just above my seat and pointed it at the guys on the other side of the aircraft. I wish I had thought to clamp it over on the other side to get footage of myself, but I didn’t think about it until everyone was buckled in. Notwithstanding that, the folks on the other side were just fine as subjects. The rail vibrated pretty badly throughout (and thus did the camera vibrate), so much of the video isn’t usable. But the zero-gee parts came out fine. This frame grab is from the top of the initial JATO climb, at which the pilot pushes the aircraft nose over and floats the occupants. At the conclusion of the flight, they bring Fat Albert to a pretty abrupt stop and open the rear cargo door simultaneously. Everybody gets tossed forward, but not as hard as you’d expect. And, when you look out the back door, you see just how little runway they used to get her down and stopped. We’re talking a couple of thousand feet here. The entire experience lasts only 12 minutes. It seems much longer. 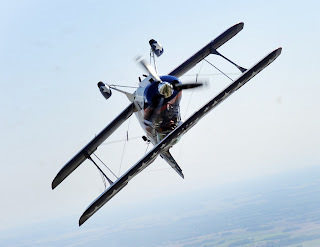 Among the new sensations on this flight are aerobatics with only limited outside references. There’s an approx. 18” window on the opposite side of the aircraft and you can sometimes see outside references (and sometimes not). When you can see the ground, it’s very close and it’s moving at around 350 knots. I have audio, video, and stills that I’ll be turning into a full episode soon. Just wanted to get some of this material up so that you could see it right away. 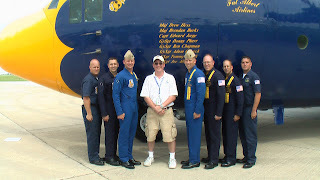 Many thanks to the Indianapolis Air Show and to Fat Albert Airlines for this spectacular ride! Matt Kryger of The Indianapolis Star was kind enough to send me some pictures from yesterday’s photo flight with Billy Werth of Grayout Aerosports. I’m the guy in front operating a couple of cameras and an MP3 recorder. Like I said before, this was a great flight so several reasons, the most compelling of which was that this was my first time being in formation. Both the photo ship pilot and Billy did a great job of making sure that everything happened to put the Pitts in the best possible position for the shoot. That involves, among many other things, flying the right attitude, putting the sun in the right position, keeping the photo ship’s shadow off of the beauty airplane, and other considerations. If Billy was challenged by any of that, he sure didn’t show it. A great couple of pilots on this flight and I really enjoyed getting to see it happen. This shot graced the front page of the Star today. You can’t recognize either Billy or me in the picture, but Billy was credited in the text, so he received due notoriety for the shoot. Stay tuned for more from the Indianapolis Air Show. And follow the show on Twitter as @IndyAirShow. I’m here all day tomorrow covering the show before beating a hasty retreat back to Michigan to see what has piled up on my desk. It’ll be Sunday, so I’ll be in the red Airspeed shirt wandering the ramp with MP3 recorder and camera in hand and deranged fanboy look in my eye!